Analyzing new and diverse digital data streams can reveal new sources of economic value, provide fresh insights into customer behavior and identify market trends early on. But managing this influx of new data can be a challenge. To derive real business value from big data, you need the right tools to capture and organize a wide variety of data types from different sources, and be able to easily analyze it with your enterprise data. 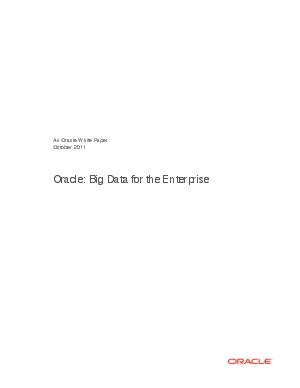 By using the Oracle Big Data Appliance with Oracle Exadata, enterprises can acquire, organize and analyze all their enterprise data to make the most informed decisions.